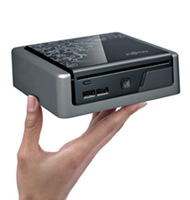 Fujistu unveils a new mini PC which is no doubt a very small one in size. Mini computers are growing rapidly in this 21st century as our mobile phones are becoming a sort of computer systems too because they are now equipped with processors, rams and storage space. Netbooks were recently introduced too to cop-up with the current market trend of things getting smaller and useful. Fujistu introduced a real mini PC with a core2duo processor in it. Cost of Fujitsu ESPRIMO Q1500 is 699 Euros.